most beautiful spots of the city with the best guides. Since our formation, we have done our best to offer both locals and tourists the perfect experience with regard to city tours. We want to give you more than the unique driving experience with the Segway®. Therefore, we constantly broaden and alter our tours, discover new routes for you and count on personal support by multilingual tour guides. This even allows guests who have already been on tour with us to discover new facets of their city time and again. When choosing our tour guides one thing particularly stands out: friendlyness! We think this is our foundation for a good introduction, a safe tour, driving enjoyment and of course broad background information to the municipal history. To ensure all of that, we invest a lot of time in the selection process of our tour guides and the following training in technology & municipal history. have short distances and more time for their city trip. SEG TOUR GmbH is a true family company. Our value-oriented company culture ensures a strong cohesion and trusting relationship with our partners and guests. Every single employee feels responsible for the company’s success and works with great commitment and passion. Since our formation we count on the sustainable operation of all locations. Our Segways® get solely charged with electricity produced by using renewable energy sources. Our servers run carbon-neutrally and our complete office equipment has the Energy Star® certificate. In addition, we are constantly checking where we could work even more resource-conserving. The coordination of tour guide, customer service and our guests implies that we are linked up extremely well. And we are! We have relied on our in-house software from the start. It enables our guests to be central and the tour planning runs smoothly. As certified tour operator, we work closely with the importer, the KSR Group. 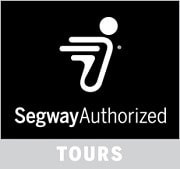 In this way it is guarateed that our Segways® are maintained regularly and only original parts are used for service.